The FlexiDomeXF series are the ultimate solutions for virtually any indoor or outdoor surveillance application. 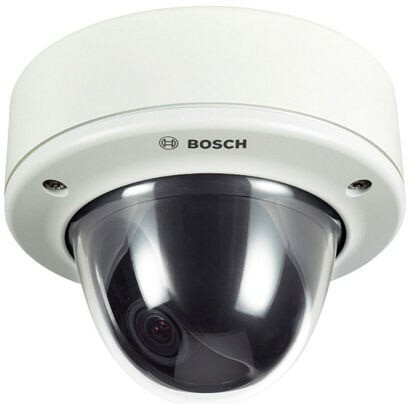 These colour dome cameras are high performance, vandal-resistant units with NightSense. The cast-aluminium housing, polycarbonate dome, and hardened inner liner can withstand the equivalent of 55 kg (120 lbs) of force. The enclosure contains full featured colour cameras with 1/3-inch CCD and integral varifocal lenses. Ideal for outdoor use, the cameras are protected against water and dust to IP 66 (NEMA‑4X) standards. Installation is quick and easy, since the cameras come completely assembled and ready to use. Using the proprietary pan/tilt/rotation mechanism, installers can select the exact field of view. Mounting options are numerous, including surface, 4S (USA), wall, corner and suspended ceiling. The FlexiDomeXF series incorporate the latest technology adopted from the high-performance DinionXF Colour cameras. This technology ensures the highest possible image quality at all times and under all conditions. Based on a unique combination of 15- bit digital video processing and XF-dynamic, these cameras provide excellent sensitivity, with up to 32x extended dynamic range. This delivers a sharper, more detailed image with outstanding accuracy in colour reproduction. Bilinx, a technology that allows technicians to set up, control the camera settings, and even update firmware remotely over the video cable.